1. Any idea what could be causing color changes in the startup logos? Logos are fine in many cases but colors sometimes change depending on who the opponent is. 2. Is there any shortcut to capture the colors in the original logo and transpose them into the palette or is that a manual process? I'm importing 48x48, 16-color bmp files. You're probably changing colors 1-7 on the palette. Don't, those are reserved for the Home/Visitor banners (which is why your colors change with each team change). So when changing any team logos, colors 6 and 7 are white/black, and you really have 8-16 (9 other unique colors) to use for the logo. There are two things I'd recommend if you are using new logos for your ROM. 1st is to use Smozoma's ditherer program to get the image down to 16 (or in this case 9 plus black and white) colors - http://forum.nhl94.com/index.php?/topic/14421-tool-genesis-image-ditherer-to-16-colours/. It's an amazing tool. One of the choices is to create a darker version of the picture and the program spits out the palette in a text file. You still have to enter it manually, but it's pretty slick. 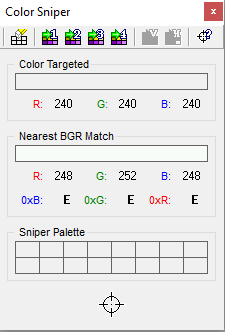 Another option is to use the color sniper in NOSE. This is a useful tool to get the nearest matching color of a picture to something that TM / Genesis can use. So let's say I wanted to take the team logo from the 5th team in one ROM and make that my first team in my new ROM. I would go to offset 1C9910 of the existing ROM, select a block size of 4D6 and copy. Then I'd go to offset 1C85B8 in my new ROM and paste over. Then do the same for the palette 1C826E, block of 20, paste to new ROM offset 1C81EE. Boom, team logo copied over. You can copy/paste for everything as long as you know the offsets/length. The trickiest ones are team strips and center ice logos as the offsets change with every change in player data, but you can jot down the offsets in NOSE for each ROM as a reference for future work. Good luck, hope this helped. This is HUGE! It will save me hours of time! I am so stupid for the way I have been doing it!